On the first personal computer we owned at the house in which I grew up, my father played the first five Tomb Raider games. Most of the time he played the games, there stood a second chair next to his, on which I watched him playing. That was when I first encountered videogames more impressive than Freddi Fish, and they sparked an interest in the medium that would ultimately lead me to studying video games at university. When I was some years older, I started to play Tomb Raider myself. However, though I eventually finished most games of the series, there was a large difference between the way I played the games and the way my father did. I, to be honest, was a coward. I hated to repeat segments I had already completed, and therefore saved the game as often as I could. Unfortunately, the number of times you saved was tracked, and then displayed in the main menu. My save screen for the first Tomb Raider therefore showed an astonishing amount of 294 saves.1Luckily, I owned the PC-version of the game, which enabled unlimited saving at every moment in the game. In the versions for the PlayStation and Saturn, saving is limited to certain points, indicated by a floating crystal. That is on average one save every three minutes, and twenty in each of the game’s fifteen levels.2On the other hand, these numbers are comparable with the amount of automatic saves later games in the series make per level. Tomb Raider: Legend contains on average twenty checkpoints in each of its seven main levels, for example. My father, however, played Tomb Raider in quite a different way. While my screen showed 294 saves after fifteen levels, my father’s showed ten saves after ten levels (and twenty after completing all of Tomb Raider III’s twenty levels). Indeed, after he had finished each of the first five Tomb Raider games the first time, he would restart it and try to beat every level without saving, except directly at the beginning of it. Given the hazardous nature of most levels – there are many ways to die instantly – and the fact that most of them can easily last 30 minutes or longer, it is not hard to imagine that this often must have been immensely frustrating. To make things yet even more complex however, my father wanted to find every secret in the game. If he therefore completed a level while missing one, he still needed to play the level again. Though walkthroughs and cheats that enabled unlimited ammo and the possibility to skip levels could have made things easier, my father was – at that moment – unaware of their existence. I later often wondered what his motivations for playing Tomb Raider this way were. One of them I knew: by saving in the beginning of a level, and then making all subsequent saves in the next slots, he later had the ability to choose levels at will – something that was particularly useful as I often asked him to play my favourite levels. This, however, did not require beating the level without saving, as using two save slots for each level could produce the same result. Of course, scholarly articles could shed some light on the case, as my father was not the first gamer who imposed himself such a harsh rule while playing, and he certainly will not be the last one. In fact, gaming itself has famously been defined as “the voluntary attempt to overcome unnecessary obstacles”.3Suits, Bernard. The Grasshopper: Games, Life and Utopia. Toronto: University of Toronto Press 2005., p. 170. Cited in Furze, Robert. ‘Challenge’. In: Mark J.P. Wolf & Bernard Perron (ed.). The Routledge companion to video game studies. New York & London: Routledge 2014: p. 143-151. Some obstacles are more unnecessary than others, however, which caused Bernard Perron to coin the term gameplayer for those players that set themselves goals and challenges above those offered by the game.4Perron, Bernard. ‘From gamers to players to gameplayers: The example of interactive movies’. In: Mark J.P. Wolf & Bernard Perron (eds.). The video game theory reader. New York & London: Routledge 2003: p. 237-258. Their behaviour could possibly be explained by theories about challenge and difficulty in video games. The concept of flow for example – a state in which the player becomes fully immersed in a game – requires a right amount of difficulty: neither too easy nor too difficult.5Csikszentmihalyi, Mihaly. Flow: The psychology of optimal experience. New York: Harper Perennial 1990. While most ‘normal’ gamers find this true for the majority of their games, some expert gamers can quickly find the game they are playing too easy. Imposing additional rules can then get the difficulty balance right again, so that for these players the state of flow is restored. When I recently asked my father about his way of playing Tomb Raider, his answer pointed exactly to this, as he said he did it to get a better sense of achievement from the otherwise quite easy games. Yet, from the perspective of the game scholar, this still left several interesting questions unanswered. Why this challenge in particular, for example, and how had it altered his experience of playing Tomb Raider? Thinking about these questions had made me rather curious by then. Obviously there was only one way to really answer them: I needed to try my father’s way of playing Tomb Raider myself. For my ‘experiment’, I chose to play Tomb Raider III, which I had always liked for the diversity of its levels and its excellent soundtrack. Though I had finished it some years earlier, I soon discovered that I had forgotten most of the details and secrets of its levels, making it essentially a fresh experience. The game consists of five quite distinctive acts in different regions of the world (India, London, South Pacific, Nevada, and Antarctica), usually containing three large levels and a shorter boss fight. As I first wanted to try just one of these acts, I randomly selected the act placed in London. In the end, this turned out pretty well, as the four levels within this act offer a mix of gameplay that is quite representative for the gameplay of Tomb Raider games in general. The first level – ‘Thames Wharf’ – is placed on London’s rooftops and mainly focuses on platforming, with hazardous traps and large pitfalls. 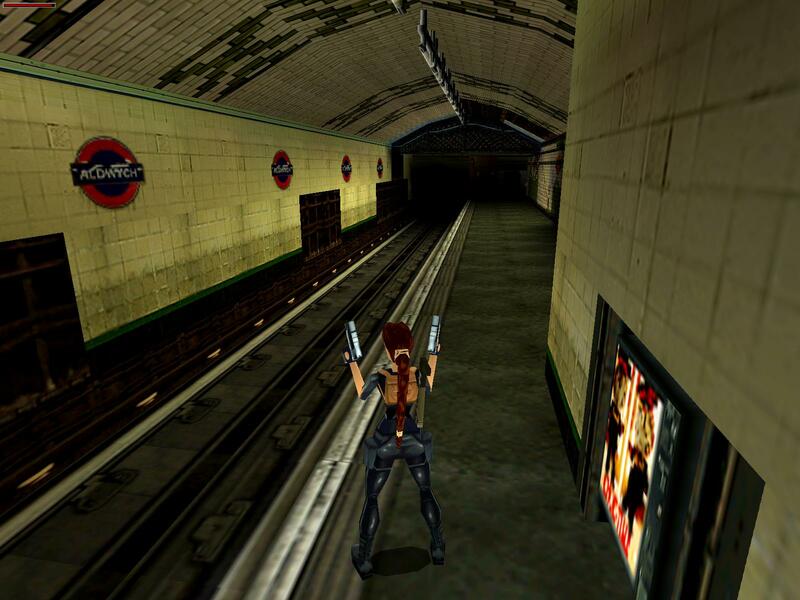 In the second level – ‘Aldwych’ – protagonist Lara enters an old subway station. The emphasis here is mostly on exploring and puzzling, which is needed to find the objects that eventually provide access to the third level: ‘Lud’s Gate’. This level can in fact be divided into two halves, of which the first requires a lot of platforming in the Natural History Museum, while the second mainly takes place underwater, where Lara battles scuba divers and crocodiles. 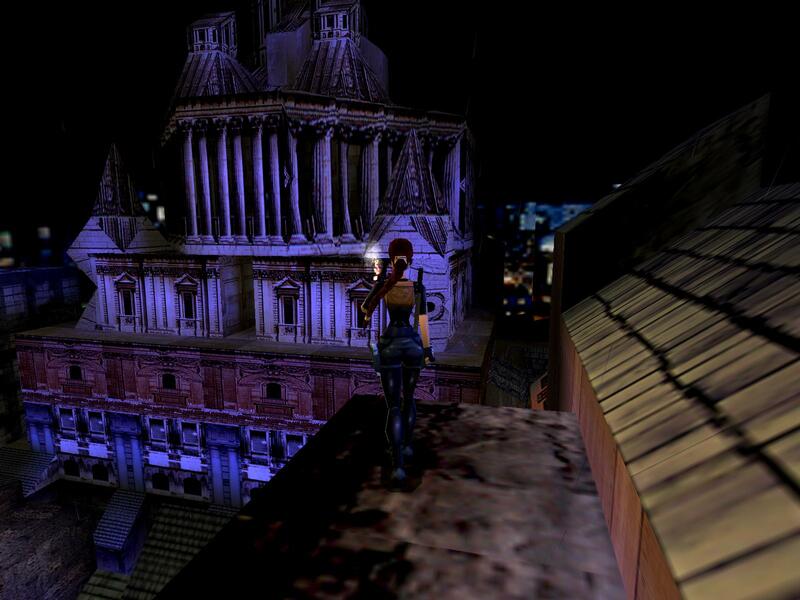 The final level – ‘City’ – is a small boss fight, in which Lara must climb a building and then shoot an electric panel to defeat the boss. As I began with ‘Thames Wharf’, my initial strategy was to simply learn how to beat the level first, without bothering too much to look for the secrets. In a normal playthrough, this mainly includes learning the layout of the level and the solutions to puzzles. Now, however, the impossibility to save also required more caution. I therefore also had to learn the exact way to perform the numerous jumps and other platforming sequences in the level, as performing a segment exactly the same way each time I had to repeat it, reduced the risk of dying. Because of this, I was much more conscious of what I was doing than when I normally played Tomb Raider. Though this slowed me down at first, it helped me to repeat segments a second time much faster. In the end I could complete segments so fast, I even started to feel like a speedrunner. Because of my heightened consciousness I completed the level after 90 minutes while dying only five times, considerably less often than I had suspected beforehand. Unfortunately though, I had missed three of the five secrets. Finding these took me another hour (and another five restarts), and then a final attempt was needed to finish the level with all secrets. Because I had played some parts of the level up to ten times by then, I succeeded without dying. Eventually, it took me almost three hours to finish ‘Thames Wharf’ with all secrets and without saving. Though I certainly felt some kind of achievement, I mainly sat back a while and wondered what I had gained by investing this much time in one level. I could think of two things. First, repeating segments had possibly made me a better player, as I had been able to repeat parts of the level much faster and with less mistakes a second time. Second, through replaying the level multiple times, I had gained a deeper understanding of its structure. I learned, for example, how each part of the level was connected to the other parts, and that the first half of the level could easily be skipped. Unfortunately, I later learned that speedrunners had figured out that the level could be completed in as little as 18 seconds. I noticed this second effect also when I moved on to the next level, ‘Aldwych’. It turned out that there were not many ways to die in this level, so that I finished it while dying only once. However, having missed several secrets forced me to play the level again twice. These replays gave me an insight in the level I would not have obtained if I had played it only once. The first time I played it, I did not really understand the lay-out, which caused a lot of backtracking. Only when I played it for the third time I noticed that it was actually constructed quite logically, and that it could be completed with almost no backtracking at all. After I had invested again several hours in finishing ‘Aldwych’, I moved on to the third and last major level of the London-act. This level contains quite some tricky platforming in its first half, as well as some secrets that are difficult to obtain. I therefore initially died several times, but eventually the same thing happened as in ‘Thames Wharf’: after I had repeated segments multiple times, something ‘clicked’, and I would then be able to complete those parts fast and flawless. By then I started to think about the way repetition could enhance a player’s skills, something which has for example also been noted by Torben Grodal.6Grodal, Torben. ‘Stories for eye, ear and muscles: Video games, media, and embodied experiences’. In: Mark J.P. Wolf & Bernard Perron (eds.). The video game theory reader. New York & London: Routledge 2003: p. 129-155. However, saving in video games can be seen as a way of reducing repetition, which could thus mean that it prevents players from reaching their true potential. This would mean that saving leads to a sort of vicious circle: the more possibilities a game gives to save, the less opportunity the player has of becoming good in the game, and the more save points he therefore needs. With this thought, I finished my run of ‘Lud’s Gate’, though finding all secrets took quite some time. After this, the last level felt much like a short cooling down, as it required only five minutes to beat, and was not hard at all. Eventually, I finished the four levels of Tomb Raider III placed in London with all secrets but without saving, which took me almost ten hours. As playing the complete game this way would approximately take me fifty hours – about three times longer than the average player7See http://howlongtobeat.com/game.php?id=10472. Last accessed on 29 March 2015. – and I had already obtained a fairly good impression of what playing Tomb Raider without saving meant, I left it with that. I had learnt several things underway. Though obvious: the inevitable repetitions caused by not saving the game provided for a better understanding of the game’s levels. However, this repetition could also have been obtained by other means: simply reloading saves again and again could have produced the same result. A second advantage can however more easily be attributed to not saving the game. This namely made the consequences of dying more severe than in a normal playthrough, which made me play more carefully. Overall, this led to fewer game over screens than I would normally see. Moreover, repeating segments multiple times led to faster performances on these segments. In the end, these results thus made me a better player: faster and less likely to make mistakes. Though these results may sound evident, they have brought to light a peculiar attribute of save points, which I had not yet seen before. While the presence of plenty of save points is often seen as something good, this experiment has shown that in some cases they can be double-edged swords: though they enhance player’s fun as they provide faster and easier progress through a game, they can also withhold the sense of achievement that mastering a game can lead to. In that sense, I finally understood why my father did not want to save: only by doing this he could really become an expert in the game, and thus a true Tomb Raider. 1. ↑ Luckily, I owned the PC-version of the game, which enabled unlimited saving at every moment in the game. In the versions for the PlayStation and Saturn, saving is limited to certain points, indicated by a floating crystal. 2. ↑ On the other hand, these numbers are comparable with the amount of automatic saves later games in the series make per level. Tomb Raider: Legend contains on average twenty checkpoints in each of its seven main levels, for example. 3. ↑ Suits, Bernard. The Grasshopper: Games, Life and Utopia. Toronto: University of Toronto Press 2005., p. 170. Cited in Furze, Robert. ‘Challenge’. In: Mark J.P. Wolf & Bernard Perron (ed.). The Routledge companion to video game studies. New York & London: Routledge 2014: p. 143-151. 4. ↑ Perron, Bernard. ‘From gamers to players to gameplayers: The example of interactive movies’. In: Mark J.P. Wolf & Bernard Perron (eds.). The video game theory reader. New York & London: Routledge 2003: p. 237-258. 5. ↑ Csikszentmihalyi, Mihaly. Flow: The psychology of optimal experience. New York: Harper Perennial 1990. 6. ↑ Grodal, Torben. ‘Stories for eye, ear and muscles: Video games, media, and embodied experiences’. In: Mark J.P. Wolf & Bernard Perron (eds.). The video game theory reader. New York & London: Routledge 2003: p. 129-155. 7. ↑ See http://howlongtobeat.com/game.php?id=10472. Last accessed on 29 March 2015. Although Bjorn Schrijen studied Dutch Language and Culture at the Radboud University Nijmegen, he wrote his master's thesis about canon formation in the video game industry. In his personal canon, you can find games such as To the Moon, Final Fantasy VI, Tomb Raider, Super Mario Galaxy and BioShock. He currently works at a Dutch company dedicated to creating professional automated chat applications. Read more about Bjorn at https://nl.linkedin.com/in/bjornschrijen.